After recovering from the car accident that killed her best friend, Miranda's parents take her and her brother along on a work trip to York, England to get their minds off the tragedy. But the accident left Miranda with more than just physical and emotional wounds; it also gave her the ability to see ghosts. So far she's been able to avoid facing the spirits that ask for her help, but in the "the most haunted city in the world" there's nowhere she can hide. At night, cornfields looked like the ocean. I visited York a few years ago so when I saw that Dark Souls was set there, I knew I had to download a sample on my Kindle. The sample lured me in and though the price was a bit more that I usually pay for ebooks, I paid it and was not disappointed. In fact, I couldn't put it down and stayed up past midnight to finish it. The author says she took some liberties with the setting but it seemed spot on to me. In fact, the parking lot near Clifford's Tower that the characters get lost in is one that we also ended up hiking through during our visit. I had a lot of fun spotting all the places we visited and recognizing some of the ghost stories told to us by our haunted York tour guide. Of course without a fun story I wouldn't have bothered to read about the setting. Seeing ghosts is not a new theme in fiction but here it feels fresh. While the story's not incredibly scary, there were a few moments that made me shiver. Only a couple of complaints: In my Kindle version, there were a few spots where there were missing returns between lines of dialog which made following conversations a bit confusing. Also, the main character's parents are often referred to by their first names which threw me initially (I kept wondering, "Who is Jeff?"). It's third person point of view so I understand why the author did that, but in my head it still feels like the main character is calling her parents "Jeff" and "Peggy". All in all it was a fun, quick read. 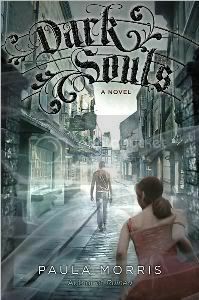 If you're looking for a Young Adult book with an interesting setting and a ghostly premise, I wouldn't hesitate to recommend Dark Souls. So cool. York is exactly as I pictured it with the narrow, stone streets and old buildings. Miranda has spotted a ghost. He really does look like a ghost since he's all blurred out. Such an original cover!